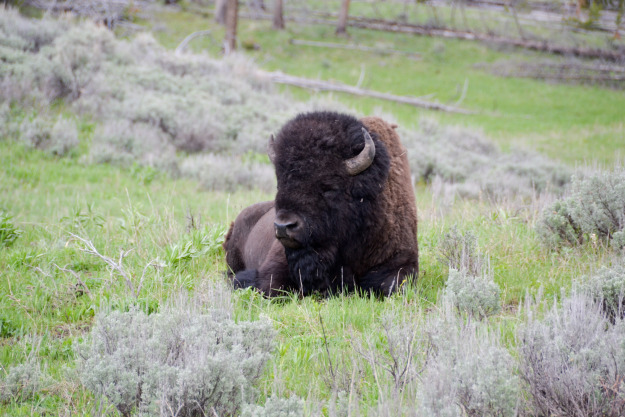 Day 10: on the ground in Yellowstone National Park – EHFC Members Talking! Wow, wildlife and scenery at Yellowstone…snow in June! After grabbing our rental car, we head into the small town of West Yellowstone, Montana to grab lunch and then go into Yellowstone itself. The town is small, mostly just a crossroads outside of the western entrance to the Park, but we had a great lunch at the Woodside Bakery — and make a note to come back for breakfast! Heading into Yellowstone itself, we weren’t disappointed, with awesome views as soon as we crossed the toll booth. With only the afternoon at the park, we didn’t have time to explore very far off the beaten path, so we spent most of our timing driving from sight to sight, enjoying the views along the way.